1 model, 3 artists, 3 paintings, 3 styles, and 3 hours: the Face Off is once again here! Principle Gallery is hosting the three of us, Mia Bergeron, Cindy Procious, and me (Elizabeth Floyd) in the gallery as they paint for a live audience. Join us Saturday, August 27th from 1-4 PM to grab some refreshments, watch these three fabulously talented women paint, and to check out each artist's group of brand new artworks! I will be showing new work at this exhibition, a bunch of still-life paintings and one figurative piece. Stay tuned as I update my website with all the images. And if you are in the area, please come on out to see the exhibition and portrait demonstration! Narcissus 'tete-a-tete' are some of my favorite harbingers of a warmer season to come. Just a quick hello to share some fun news. This month I have several pieces in the Principle Gallery's Still Life Invitational: The Language of Objects. My work will be alongside some phenominal still-life artists, like Teresa Fischer, Cindy Procious, Jacob Pfeiffer, and Louise Fenne, to name a few. I feel so honored to be a part of this exhibition. The opening reception is this Friday! April 15th, from 6:30-9:00pm, and then on Saturday, April 16th I will be at the gallery participating in a live painting demonstration from 1-4:00pm. Pansies were the first flowers that came back to life in the garden this spring. I love these colossus pansies because their flowers are so large and dynamic. I love pairing nasturtiums with delicate items. If ever I am in need of a painting "pick-me-up" I invariably seek out some apples to paint. This Cox Pippin was handy and I am so happy with how it turned out, just between you and me, I love how the yellow color notes in the apple are also found in the old Coca-Cola crate. With the shortening days and the cooler nights, my garden is beginning to slow down except for the pansies. 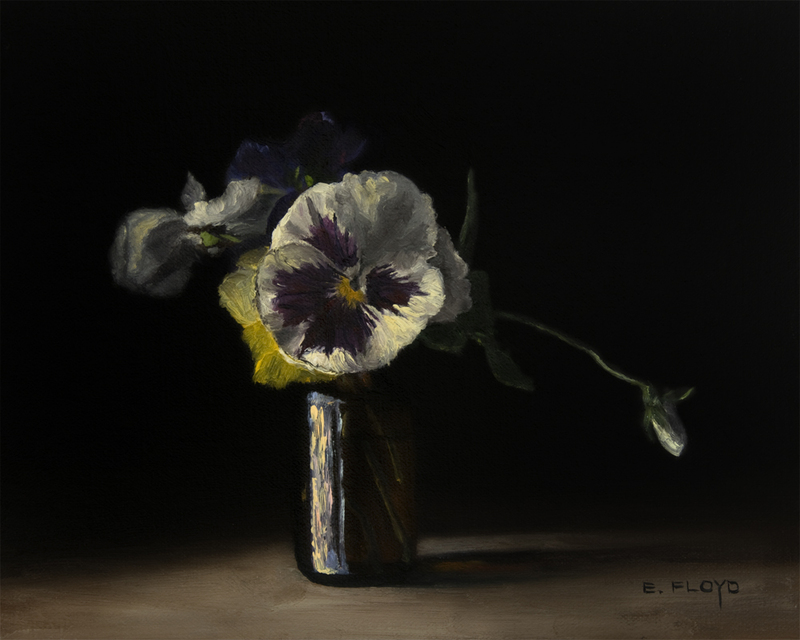 Expect to see several more paintings of pansies in the coming weeks. What draws me to nasturtiums are the graceful lines of the stems and strong geometric shapes of the flowers along with the circular leaves. Sunflowers in a Stoneware Pitcher As a gardener, I allow volunteers to take root, mostly because I love all that may come from these unexpected guests, and this year I was blessed with four volunteer sunflowers. They are not the gigantic flowerhead variety, but more diminutive, and to me, more delicate and charming. This was my last tulip painting I was able to focus on this past spring before the temperatures got hot and every tulip lost its vigor. I had been admiring the tulips blooming in the garden and was somewhat hesitant to strip them from their place when I reminded myself that if they were painted, their beauty would remain for additional enjoyment for days to come. 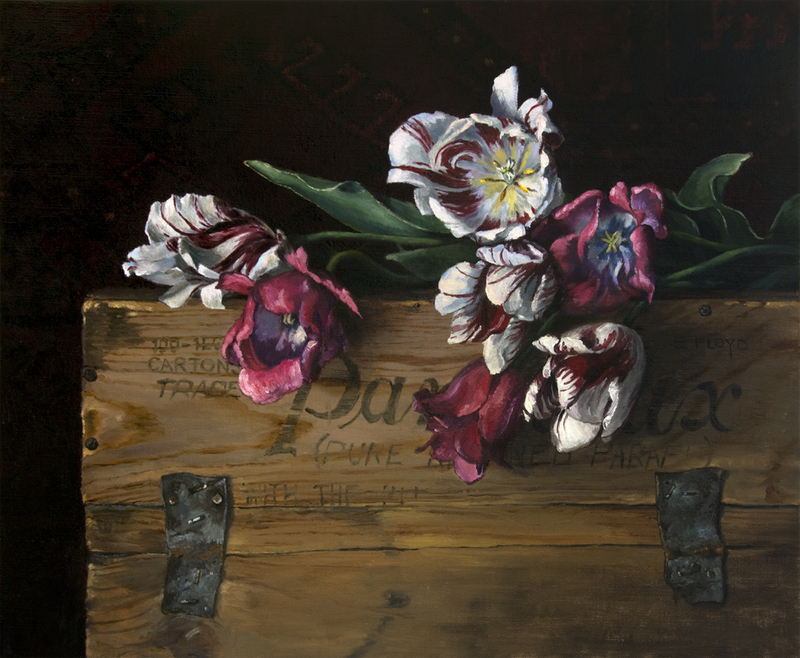 So with this painting, I am sharing all that I love and believe is special about Rembrandt tulips, basking in the deep variegated color and the beautiful and graceful shapes of the flowers that split between subdued curves and whimsical arabesques. To me, Rembrandt tulips epitomize all that is special about tulips, deep variegated color, beautiful shape, and a graceful curve of stem and leaves. 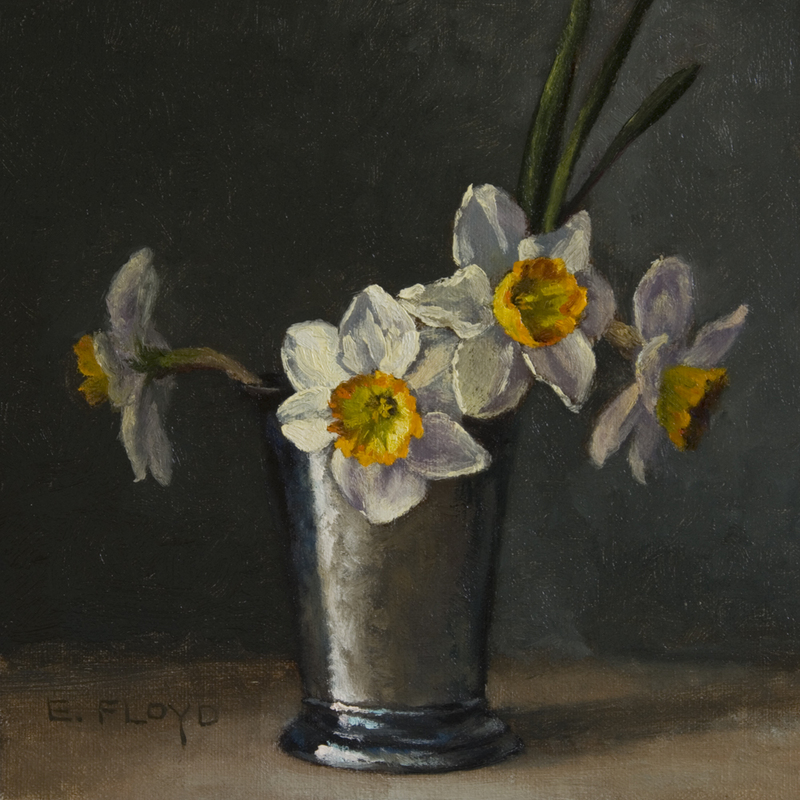 Tete-e-Tete daffodils are one of my favorite of the narcissus family to paint. They are tiny in size and still have so much personality, and are also some of the earliest to poke out of the ground to begin blooming. This painting was my first demonstration during the flower painting workshop I taught a few weeks ago. I started with these flowers because I wanted to focus on how to simplify and abstract the shapes of the flowers when beginning a painting. By simplifying the organic shapes of flowers into basic geometric forms, one can easily breakdown the complexity that is often found in bouquets and create unity within a painting. 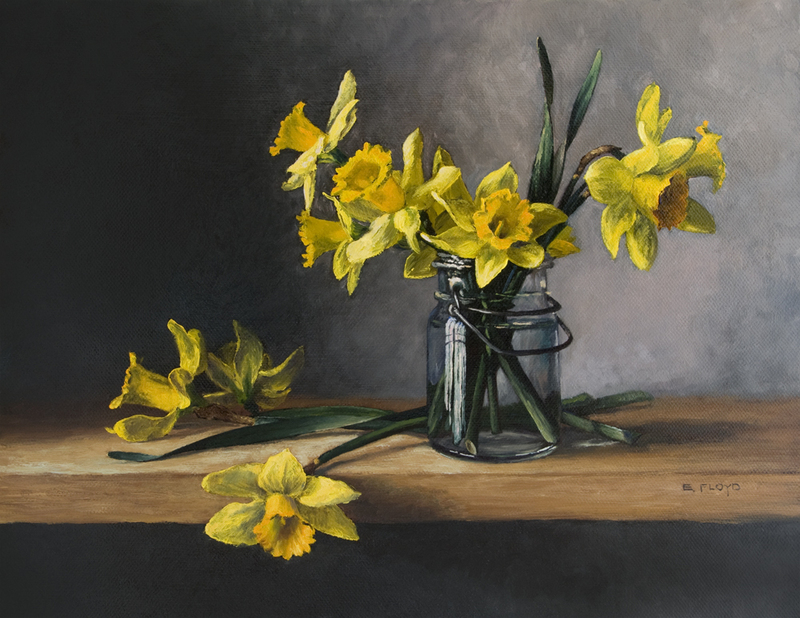 And daffodils are great painting subjects because their petals and trumpets can both be simplified into hexagonal patterns. This winter I was given some paperwhite bulbs from my sister. It was an appreciated gift that kept on giving through the gray months of January and February. The first spring that we lived in our home I was delighted to discover some daffodils blooming under and around a large oak in our yard. And in the subsequent years I have added more and more patches of daffodils, all in anticipation for the first daffodils to emerge from the ground. As spring starts to show in the world, I become full of hope and excitement. Every morning I will go out and scout the areas where I know some bulbs were planted, just to see what may have emerged in the previous 24 hours. Sometimes counting the number of flower buds in anticipation of floral abundance and what I may bring inside to paint! This painting was completed last spring, just as the world was warming up. I was motivated to capture every sparkling detail and shimmer of the cool spring light that was filtering into the studio. I was fascinated with the bright yellows and translucency of the petals, and how notes of glowing color could be found when I would slow down and observe the flowers carefully.